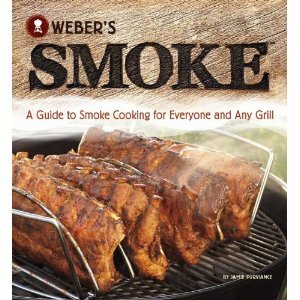 Weber's newest cookbook, Smoke; A Guide to Smoke Cooking for Everyone and Any Grill, hit bookstores in April. Weber-Stephens was kind enough to give The "Q" Review a copy upon it's release. With the wealth of BBQ knowledge available on the Internet, I don't spend a lot of time with cookbooks. However, the Weber name still carries a great deal of weight in the BBQ world and I'm grateful for this opportunity. Smoke was written by respected chef and author, Jamie Purviance. Chef Purviance has collaborated with Weber-Stephens on numerous grilling cookbooks including the best sellers Art of the Grill and Weber's Big Book of Grilling. With Smoke, Chef Purviance aims to take the mystery out of cooking with smoke "for Everyone and Any Grill." Smoke opens with a complete rundown of common styles of grills and smokers. Chef Purviance gives solid tips (with illustrations) for getting real smoke out of nearly any outdoor cooker. There are also useful suggestions for novice smokers regarding equipment and pantry essentials. One section, in particular, that I found especially useful was a chart for pairing hardwoods with specific dishes. This information is invaluable for beginners. It's a subject that I'm asked about as much as any other. Pairing the right wood with the correct food can make all the difference. Smoke does a nice job of describing the smoke flavor/aroma produced by each wood and which foods the best compliment. The recipes are categorized by meat type and range from direct grilling to low and slow smoking. There are even a few vegetarian recipes. In my opinion, the very best part of Smoke is Tim Turner's photography. Each recipe is accompanied by a beautiful, saliva inducing picture. In terms of difficulty, I would classify most of the recipes as intermediate. The directions are clearly written and easy to follow. The pictures also provide something to shoot in regard to presentation. Many of the recipes include homemade rubs and sauces to be paired with the meat. In many cases, commercially produced rubs and sauces can be substituted. The emphasis in Smoke is clearly on the equipment and technique. Some of the recipes like "Three-Meat Meatloaf'' (pg. 53) are nearly identical to my own. Others, like "Championship Spareribs" (pg. 103) differ a great deal from techniques that I typically employ. Each recipe specifies the ideal grill/smoker for the particular dish. However, they're also adaptable to fit whatever backyard cooker you own. I've done test runs on a couple of Chef Purviance's recipes with solid results. I've also marked several others for test runs this summer. Weber-Stephens and Chef Jamie Purviance have created an excellent guide for beginners and intermediate backyard cookers. Smoke contains no groundbreaking secrets, but it does provide a wealth of techniques and recipes complimented by outstanding photography. I wouldn't hesitate to recommend it as a gift for aspiring BBQ pit masters. Smoke is available at top retailers like Barnes & Noble and Amazon. 0 Response to "Weber's Smoke - A Guide to Smoke Cooking for Everyone and Any Grill"